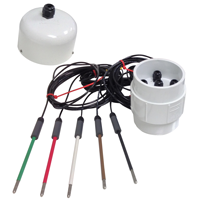 The WLC-HWH4 Hanging sensor can be used in situations where there is not enough overhead clearance to allow for a standard WLC solid sensor rod, which would be the typical choice. Each sensor is set and secured with a conventional compression fitting to insure it stays at the correct level. These advanced electronic water level sensors are also color coded so they can be identified all the way through to the color coded control panel connections. The WLC-HWH4 comes as a kit and part of that kit is a color coded terminal block in a NEMA4 enclosure. This enclosure is typically mounted within a few feet of the sensor head assembly. This is a great alternative whenever the space over the top of the environment is limited. *Additional length available. We can also supply the necessary shielded wire between the J-box and the control panel.